Hermann Bange leads the Trace Gas Biogeochemistry group at the GEOMAR in Kiel, Germany, and is a co-lead investigator in the PETRA project. 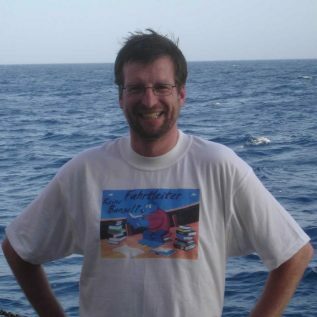 He is a marine chemists and his main research interests include the biogeochemistry emissions of climate-relevant trace gases (N2O, CH4, DMS, CO), biogeochemical time-series observations and measurements of short-lived intermediates of the nitrogen and sulphur cycles such as NH2OH, NO, DMSP and DMSO. His working group operates worldwide and regularly takes part in ship campaigns in the Atlantic, Pacific and Indian Oceans, as well as in the Baltic Sea. PETRA is his first project in the Arctic Ocean. Within PETRA, Hermann will coordinate the contribution of GEOMAR which include measurements of DMS/P/O and CO as well the participation of PETRA in the R/V Polarstern cruise PS114 to the Fram Strait in July/August 2018. PETRA is co-funded by the German Federal Ministry of Education and Research and by NERC.